Do Most Graduates of Our Education System Not Contribute to the Economy? There is such unevenness that our higher education system has been largely ineffective in improving scientific output in particular or economic output in general. The 2018 report of Science and Engineering (S&E) Indicators is expected soon, at the time of writing this letter (note: it has since been published). In anticipation, I revisited the 2016 report of Science and Engineering Indicators (SEI 2016). I was intrigued by the section titled: ‘Science and Technology in the World Economy/Workers with S&E Skills’, where a nation’s innovative capacity and economic competitiveness are linked to the number of workers with S&E skills. To enable this, governments have made increased access to S&E-related post-secondary education a high priority. In 2012, the global estimate of first university degrees in S&E was about 6.4 million, with China (23%) and India (23%) accounting for almost half of these degrees. Another 21% was conferred in the European Union (EU), while the US accounted for only 9%. Moreover, India accounts for 29.3% of the global total of 13.6 million graduates with non-S&E first university degrees, a figure that I view with some cautious optimism: if true, it means that our higher education system has been remarkably successful in increasing access to postsecondary education across the board (i.e. both S&E and non-S&E). However, does this translate to better economic performance and better innovative capacity? Again, elsewhere in the same report we have data compiled of all S&E articles in all fields, by region, country and economy for the period 2000-2013 on a fractional count basis and nominal GDP, again by region, country and economy for the period 1999-2015 in terms of millions of current dollars. This data can be rearranged as shown below, so that the world share of publications and the world share of nominal GDP can be compared to the world share of first university degrees awarded in 2012. 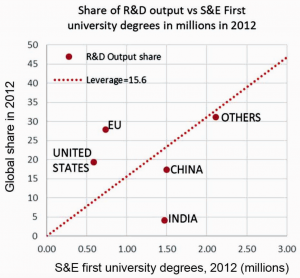 We can also propose leverage terms – that is, a world share of 100% nominal GDP is correlated to 20 million graduates to give a global leverage (norm) of 5 and a world share of 100% R&D output is correlated to 6.4 million S&E graduates to give a global leverage (norm) of 15.6. We can see from the table and the chart that the US and the and EU perform far above this global norm, while China and the rest of the world are virtually at the global norm. India is performing at a fraction (approximately a tenth in the case of GDP) of what the norm could be. So, if the estimates in the SEI 2016 are correct, it could only mean that we have been miseducating the youth in a way that nearly 90% of our graduates neither contribute to the economy nor enable innovation. Degrees in India are not without value and the SEI data allows this to be quantified. There is such unevenness that our higher education system has been largely ineffective in improving scientific output in particular or economic output in general. This article was originally published by Current Science and has been reproduced here with written permission. Gangan Prathap is affiliated with the Vidya Academy of Science and Technology, Thrissur, and the A.P.J. 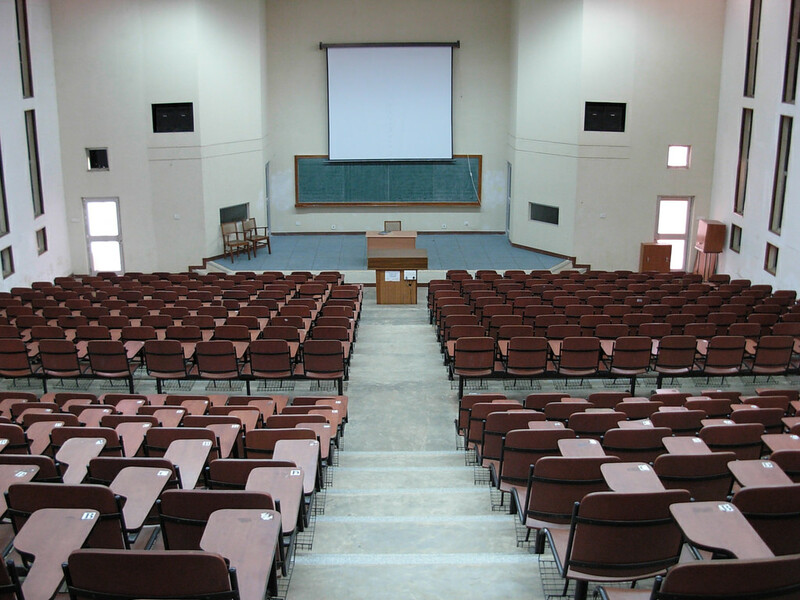 Abdul Kalam Technological University, Thiruvananthapuram.